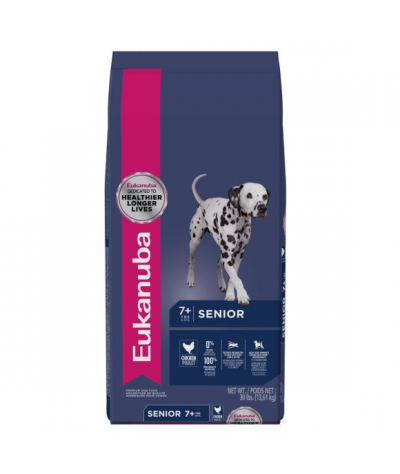 Keep your senior dog feeling healthy and happy by serving him Eukanuba Senior Dog Food. This food offers the type of nutrition a dog needs to thrive in his later years. Best of all, your dog will love the great chicken taste. Promotes optimal digestion with prebiotics and clinically proven beet pulp. Helps support the natural defences of an aging dog with optimal levels of beta-carotene and vitamin E.
The Eukanuba Mature & Senior Medium Breed 15kg Dry Dog Food is formulated with a carbohydrate blend that is scientifically proven to provide sustainable energy so your dog can maintain healthy activity levels for his daily activities. Optimal levels of Vitamin E and Beta-Carotene support the natural defences of your aging dog so he can continue to take on new challenges – every day. Prebiotics and clinically proven beet pulp support your dog’s digestive health and nutrient absorption. In addition, chicken is our primary source of protein to give carnivorous dogs a natural element so they can build and maintain strong, lean muscles and calcium supports strong bones to stay athletic and active. Since you want your best friend to not only stay great on the inside but show that he’s proud and extraordinary on the outside as well, this senior dog food contains an optimal ratio of omega-6 and -3 fatty acids to promote a healthy skin and radiant coat while they also help to reduce shedding by up to 80%. Eukanuba Mature & Senior Dog Food for Medium Breeds uses 3D DentaDefense technology, which cleans your dog’s teeth with every bite, reduces tartar build-up by up to 80% and helps your senior dog maintain strong teeth. Our medium breed food is developed with veterinarians and is recommended by top breeders. It is 100% complete and balanced to help your best friend challenge all limits in life. Especially medium dogs such as Beagles, Collies, Cocker Spaniels and Dachshunds will feel great and stay their best with Eukanuba’s Mature & Senior Food for Medium Breeds! Dried Chicken And Turkey (29%, A Natural Source Of Glucosamine And Chondroitin Sulphate), Maize, Wheat, Sorghum, Barley, Animal Fat, Dried Beet Pulp (3.1%), Hydrolysed Animal Proteins, Dried Whole Egg, Brewer’s Dried Yeast, Potassium Chloride, Fructooligosaccharides (0.53%), Sodium Chloride, Fish Oil, Sodium Hexametaphosphate, Calcium Carbonate, Linseed. When feeding for the first time gradually introduce Eukanuba into your dog’s diet over a period of 4 days. We recommend feeding your dog twice a day. Divide the daily amount shown in the chart by the number of meals. These guideline amounts are a starting point and your 7+ year old dog may eat more or less depending on age, temperament and activity level. Always have plenty of fresh water available for your dog to drink. 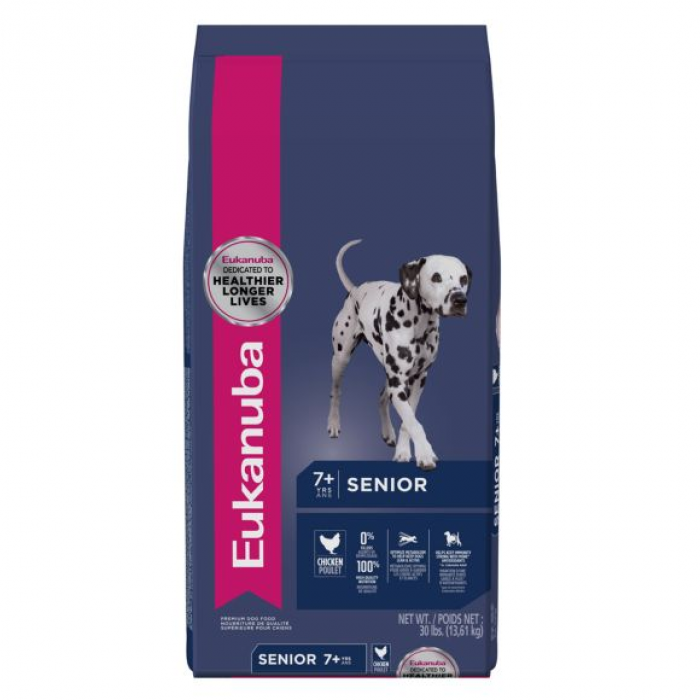 Eukanuba has been giving unmatched premium pet food for over 60 years. Eukanuba products are always safe and reliable, using only high-quality ingredients, it’s uniquely customized for your breed’s individual needs. So when you reach for a bag of Eukanuba, you can be sure your dog is getting only the best!